More friends and a blog: And about time, too. Looks like we are on the same track, Samantha. 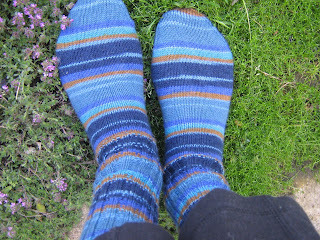 I finally got my other sock done just in time for flip-flop weather. Ah well, at least they are both done. Although I see that I should've at least lined my feet up for the pic so you could see that I matched them up. I ended up with only a teeny ball of yarn leftover but I did get the socks the length that I wanted and didn't run out so I am pleased.